Lindt shared this life-changing news on Facebook and the crowd went wild and beat a hungry path to their closest Lindt shop. 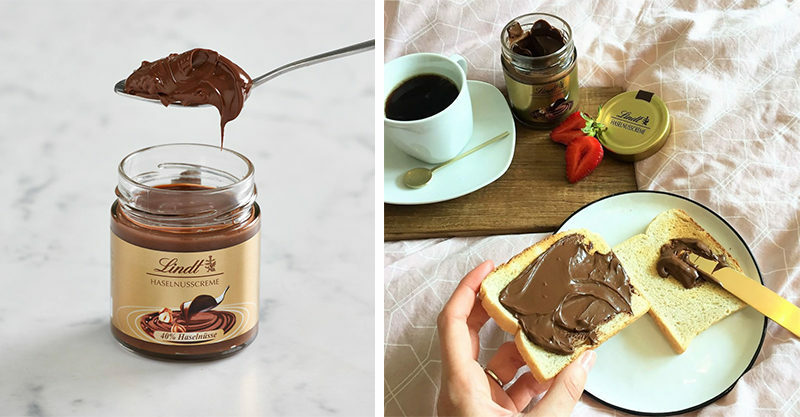 “Lindt Hazelnut Spread is currently exclusive to Lindt Chocolate Cafes and Shops and is not sold in any supermarkets in Australia and New Zealand,” the Lindt reps say explaining that it’s not available online at the mo. Not only does this famed spread have the best name ever – Haselnusscreme – it’s more hazelnut-ty than you’d dare to dream of, too. Lindt’s hazelnut spread beats the current market fave Nutella by a long shot when it comes to nutty potency. While “Nutella is made with 13 percent hazelnuts, Lindt Hazelnut Cream is made with 40 percent hazelnuts,” TIME magazine reports. The Lindt spread is also palm oil free, which Nutella isn’t. #WontSomebodyThinkOfTheForests? Still, Nutella isn’t exactly watching their backs. They sell so much Nutella, that the maker, Fererro, consume a whopping 40 percent of the world’s hazelnut supply to keep fans of the spread happy. That said, we’d always say yes to … the very luxe Haselnusscreme, given the chance! It seems that others feel the very same way. Lindt’s Facebook followers were très excited about this new development, celebrating their chocolate spread change of fortune with much gusto. “What a time to be alive!” one reveller wrote. “Imagine this on a nice piece of ciabatta!” a fancy bugger enthused. “I’m literally frothing out the mouth wow,” another shared. “Okay now I’m really about to get fat”, another posted joyously. “Enablers are everywhere in my interwebs,” someone else pointed out and honestly they’re spot on. We’ll just be over here, running – not walking- as directed.